The Playhouse Theatre is surprisingly good at hiding its Victorian gilt flourishes. It got turned into a flung-together Calais refugee camp for ‘The Jungle’ last year, and now it’s full of the scent of woodsmoke and the cramped rickety buildings of a Jewish shtetl. 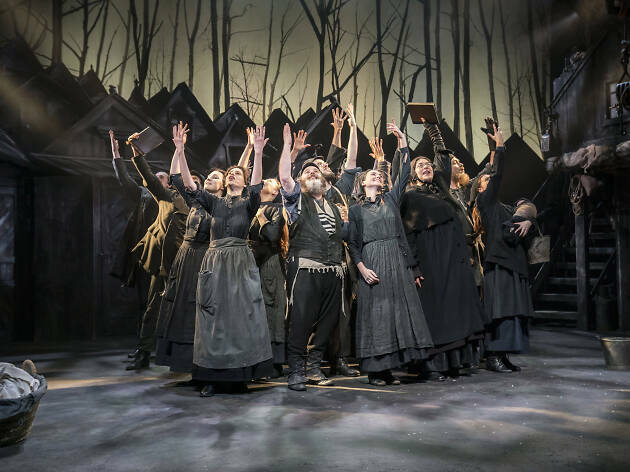 Transferring from the Menier Chocolate Factory, Trevor Nunn’s intense, dark-hued, mildly immersive production of ‘Fiddler on the Roof’ is as close as this Broadway musical could ever get to gritty naturalism. The production’s muddy colour palette is the background for nostalgia and poignancy of every possible shade. It’s based on stories by Sholem Aleichem, who wrote about the precarious Yiddish-speaking communities of mid-nineteenth-century Russia just as they started to vanish. 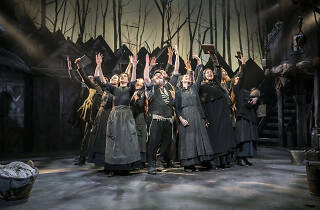 Andy Nyman makes wearily humorous work of the central role of Tevye, a dairyman who’s forever bellowing ‘Tradition!’ at his five daughters as they each concoct their own plans for their futures. His singing voice sometimes falters, but he more than makes up for it with knowing wit: he interrupts the famous opening to ‘If I Were A Rich Man’ for a leisurely scratch at his hairy forearm. But Nyman’s performance also has a real darkness, which complicates this story’s more nostalgic notes - it's especially evident in the unexpected violence of his reaction to his daughter Chava’s decision to marry a non-Jewish Russian man, even as their community is threatened by state violence. Judy Kuhn plays Tevye’s wife Golde with all the frustration of a woman who’s exhausted by tradition and her place within their marriage, as much as it sustains her. And the looming threat of the Tsar’s anti-Semitic edicts is realised in an extended final scene where family trudge away, across the theatre’s muddied aisles. If this all sounds a bit grey and dour, it’s totally not. There are flashes of extravagant fun, not least in the scene where Russian men crash into Tevye’s drinking den of choice and perform coccyx-threatening feats of Cossack dancing. And the intimacy of this staging means that when the full cast turns their faces to the audience to sing ‘Anatevka’, it’s rousing as well as solemn. This production makes Anatevka feel like a real place, an oppressive one as well as a warm, tradition-soaked one. That nuance makes it all the more powerfully emotive when this embattled community is torn apart.